I have a soft spot for couples who break the mould and do something a little bit different. The foundation of a wedding is the union of two people in love and what better way to celebrate than in Stanya and Lenny’s relaxed and quirky style. There was no bouquet, no bridal party, no wedding cake or first dance, no big traditional wedding gown or function room. The guests were asked to adhere to a dress code described as “happy”. And the groom wore thongs. Seeing the loving couple together, it is clear that these two found the perfect way to reflect their unique personalities with this beautiful adaptation of the traditional wedding. Midway through the ceremony on Hyams beach, the clouds appeared as if from nowhere. As the rain came pelting down, the couple allowed us to get creative with some unique locations to take some photographs of them. We utilised the local area, even jumping on an old vintage bus in the middle of the road to seek shelter and get to know Stanya and Lenny. 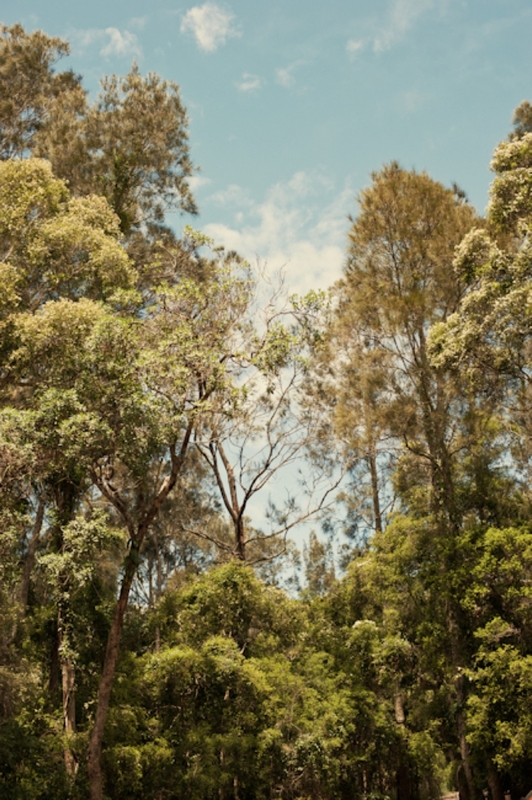 The reception was at Paperbark Camp near Jervis Bay and for the nature-loving couple this venue provided the ideal romantic backdrop for their casual wedding. The recycled timber floors and home-style food created a cosy and intimate atmosphere. The mother of the bride shared family pictures with the guests on a slideshow, and then the party moved to a bonfire in the bush with a DJ and live bongo drums. Guests soaked up the laid back atmosphere; dancing under the stars and fairy lights or sitting on logs around the fire. The celebrations kicked on until the early hours of the morning.